Sustainably sourced solid mango in a dark cherry satin finish is used to craft this set’s 78-inch table, 4 side chairs and matching bench. 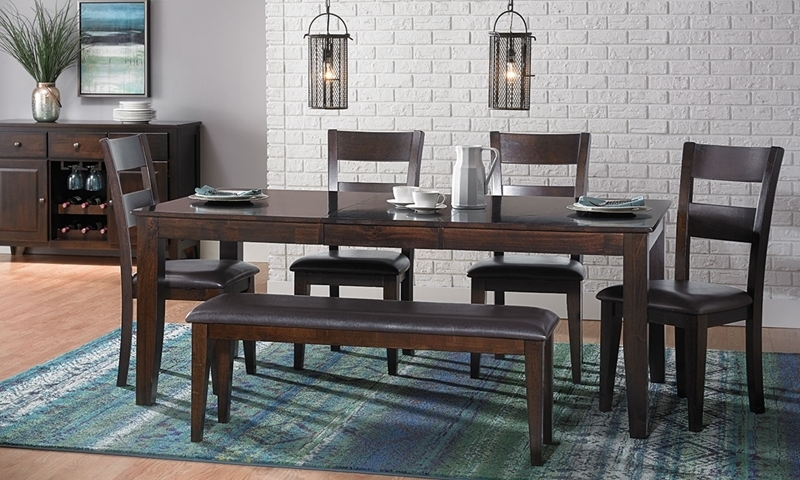 Come together around this timeless dining set, crafted from sustainably harvested solid mango wood. Six to eight can sit comfortably around the 60-inch rectangular dining table, thanks to its ability to extend to 78 inches. The bench and four included ladderback chairs showcase the same thick, tapered legs as the table, as well as cushions upholstered in black high-grade fabric. A dark cherry satin finish lends allure to the simple design of each piece, while also highlighting the beauty of the wood grain.